Heyhey, my Windows 8 /64-bit says "Insufficient system resources exist to complete the requested service." Are you able to run/install other software? Is this Windows 10? If yes, please report this to https://trac.torproject.org/projects/tor/ticket/17453. I'm excited about Tor Messenger and really want to try it but downloaded .dmg twice and got the wrong sha256sum. Same number both of time different than original one. That looks like sha1. Run sha256sum on the DMG. It should match. installed on windows 8.1 x64 without errors, running doesn't show anything, process explorer shows tor.exe for a few secs. Tor browser runs fine on the same machine. We are checking. If you have any more information you can provide, please file a ticket with the "Tor Messenger" component. This will likely be a common problem. We have plans to allow controlling the Tor process from Tor Messenger so you can refresh your circuit and get a new exit node, but that may also not solve the problem. We had (rather, have) a similar issue with TorBirdy and Mike Hearn from Google replied on how to solve this: https://lists.torproject.org/pipermail/tor-talk/2012-October/025923.html. You can try this and it may involve giving your phone number, so be careful with that. That requires you to disable tor, log into gmail to set a cookie, then reenable tor in the same browser for them to see your activity and whitelist you. How do you get the tor browser to stop using tor in order to do this? I know it's not a proper solution by any shot. But this entire blocking behaviour by Google seems to be random and this is the only solution. In future release, you can refresh your circuit and get a new exit and that might help. But it's not a definitive solution. We know this is a huge problem and we will come up with better ways to handle this in the next release. It is not a solution. You cannot solve this issue. Google raises an alert every time somebody tries to log into an account from an "unusual place". Google keeps track of where the account owner normally resides and throws a hissy fit every time s/he tries to log in from somewhere else, as determined by geoip location. The issue is not limited to Tor. It happens when you use a VPN, too. Heck, it happens when you travel abroad, too! In fact, the issue isn't limited to Google, either. Yahoo does the same. I don't use Facebook, but I suspect that they do the same, too. There is not much point in supporting these chat protocols in a Tor-dependent messenger. I suggest that you remove them at least until Google, Yahoo, and all the other snoopers decide to become more Tor-friendly. Not working on windows 7 - 64 bit. It starts and shutdowns in half a second. Does it start at all or it doesn't even start? We have tested it in Windows 7 and 8 so will need a bit more information here to proceed. Cannot malicious exit nodes eavesdrop facebook or google credentials? No, because TLS is enabled for all protocols by default. The NSA has found some weak links in the algorithms used to encrypt internet traffic. It means that whatever products or enhancements Tor developers are doing are vulnerable to US government snoops. Cannot they do a man-in-the-middle attack? No need to do man-in-the-middle attack no more. Direct attack is quicker and saves on resources and manpower. Deleting the folder should be enough since we do not write outside the folder. (Even the profile is in the folder.) If you find Tor Messenger is creating files outside its installation directory that are leaking information, please file a bug. That's odd. Can you file a bug with more information on https://trac.torproject.org/projects/tor/newticket. Choose "Tor Messenger" as the component. maybe malwarebytes did not know about tm, since tm is new beta. Using Telegram for now, but hopefully it his will scale up in utility in a couple of years. Use an OTR client like Pidgin/Jitsi/Adium/etc. for secure chatting until Tor Messenger development advances further. 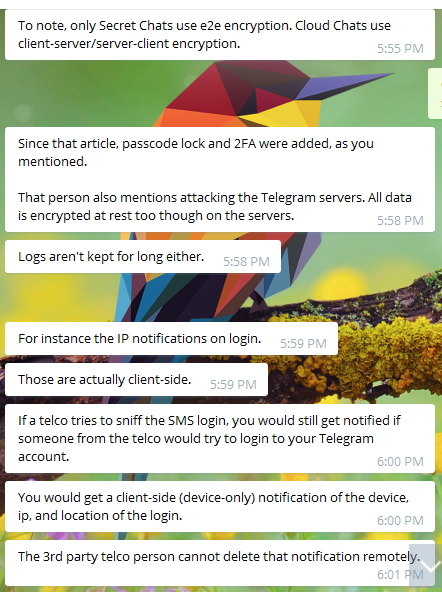 That site does not include the latest or previously existing features in Telegram, such as encryption of cloud chats, the password layer on top of 2FA, etc. And essentially that boils down to hacking into one secret chat with one trillion dollars, which is pretty much not worth it. And supposedly you'd notice, as it could take over a day for the keys to exchange. In which you would know that the chat has been compromised. I can post more info. Throws the error "Your Instantbird profile cannot be loaded. It may be missing or inaccessible." after runninf .dmg on Mac !! "On OS X, copy the Tor Messenger application from the disk image to your local disk before running it." Windows 10? Please see https://trac.torproject.org/projects/tor/ticket/17453. Sorry, this seems to be known bug that we will fix in the next release. Tor developers are a diverse group and I'm sure among them are many who hold the same beliefs as you. I'm curious why you're not interested in integrating Ricochet's concept of secure, anonymous, server-less communications entirely inside the Tor network into Tor Messenger. It seems to align perfectly with the Tor Project's aims, especially as Tor Browser's functioning (accessing both the outside web and hidden services) is so analogous to Tor Messenger (accessing both outside third party IM servers and a Ricochet-style system of hidden service IM nodes). Is it just a lack of resources (since you're so busy getting the baseline messaging client up and running)? Do you not like the Ricochet concept enough to integrate it? Do you think there aren't enough people who'd use it to be worth the development effort? Are there other important reasons? I'm sure the Ricochet developers do good work, but the Tor Project would provide a better implementation, better support, and better auditing simply due to having more funding, better familiarity with Tor, and the sheer number of people focused on your products both inside and outside of the organization. Are you planning on integrating the Ricochet concept into Tor Messenger in the future (near, medium, or distant/wishlist), or will that never occur? We love Ricochet. That's why we made sure to point to it in the blog post. Many of us use both Ricochet and Tor Messenger. The goal for Tor Messenger is to meet people where they are -- so you can have more safety on your side, while still interacting with your friends who e.g. use XMPP and OTR but haven't seen the light yet. While the goal of Ricochet (ok, one of the goals) is to give people a chat approach where there's no "middle", and thus no central point for the adversary to break in and snoop on things. Whether one day the Tor Messenger client adds support for the Ricochet protocol is still a matter under discussion by the Tor Messenger folks and the Ricochet developer. One reason against is actually because the Ricochet person wants Ricochet to be an experience (i.e. including a client with good usability), not just a standardized protocol that all sorts of apps can implement and present to the user however they want. One argument on the other side though is that Ricochet is going to have a tough time being its own self-contained network, while also still using Qt (and thus not working well on mobile). More thinking to be done there for sure. As for the "doing it inside Tor Messenger would provide better familiarity with Tor" angle, we've actually brought the main Ricochet person under our umbrella and we're happy to call him a Tor person now. So we help him, and he helps us, just as much as in the Tor Messenger case. And lastly, on the funding angle, actually neither project has any funding currently. We're working on helping both of them to fix that. Please keep in mind that you're not necessarily restricted to only using Ricochet's protocol for hidden service IM nodes, so if you are interested in the concept but can't come to an agreement with the Ricochet devs or for whatever reason can't integrate it into Tor Messenger, you could always develop your own standardized protocol (e.g. based on TorChat; though the benefits of not having to reinvent the wheel are obvious). I hope it's possible to integrate Ricochet (or something similar) into Tor Messenger in the future, as they seem like a perfect fit, and I tend to favor single programs that do everything instead of multiple programs that do one thing each (more dev eyes/interest in a larger project, and it's harder to get non-tech users interested in using multiple programs for the same function). It's understandable, though, that the Ricochet developer may not want to lose control of his project (which might occur if it gets submerged into Tor Messenger). > your friends who e.g. use XMPP and OTR but haven't seen the light yet. By seeing the light, do you mean using Tor or that there is something wrong with using XMPP with OTR?